Oxygen enters the body through the respiratory system, coming from the outside environment and into the lungs. It then crosses the alveolar membrane and capillary endothelium to get into the bloodstream. Once in the blood, oxygen needs to be transported to the various tissues of the body. In this article, we will look at that transport system, its components, the things that can alter it and some examples of when it goes wrong. Every active tissue in the body has an absolute requirement for oxygen. For the vast majority of these tissues, the oxygen is delivered by the blood to the tissues, although there are some notable exceptions (for example, the cornea gets its oxygen directly from the atmosphere). Once oxygen has entered the blood from the lungs, it is taken up by haemoglobin (Hb) in the red blood cells. 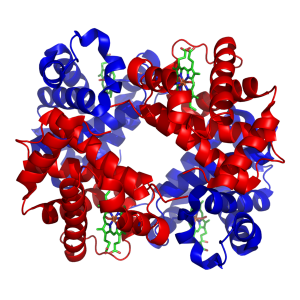 Haemoglobin is a protein that is made up of four haem groups, which contain iron ions. These iron ions (Fe2+) associated with haemoglobin molecules chemically react with oxygen to form oxyhaemoglobin. Each molecule of haemoglobin can hold four oxygen molecules. It is haemoglobin that carries the oxygen as it is transported around the body in the blood. Only a small amount of oxygen (1.5% in arterial blood) is simply dissolved in the plasma. Haemoglobin is the main component in oxygen transport throughout the body. People who have disorders affecting the quality or amount of haemoglobin suffer serious problems with transporting oxygen to their tissues. 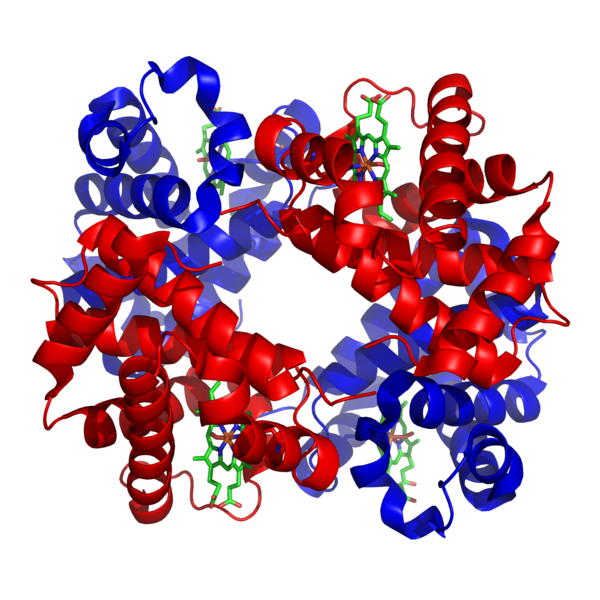 Haemoglobin is a tetramer – it is made up of four protein sub-units. As a result it changes shape based on how many oxygen molecules are bound to it. The change in shape also causes a change in affinity to oxygen; the more oxygen is bound, the higher the molecule’s affinity for oxygen becomes. This is known as cooperative binding. When no oxygen is bound, the haemoglobin is said to be in the Tense State (T-state), with a low affinity for oxygen. At the point where oxygen first binds, the haemoglobin alters its shape into the Relaxed State (R-state), which has a higher affinity for oxygen. 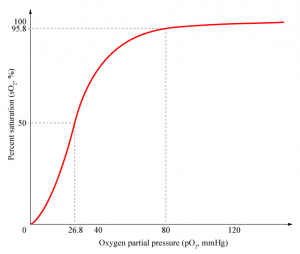 We can plot this change on a graph of oxygen saturation over partial pressure of oxygen. 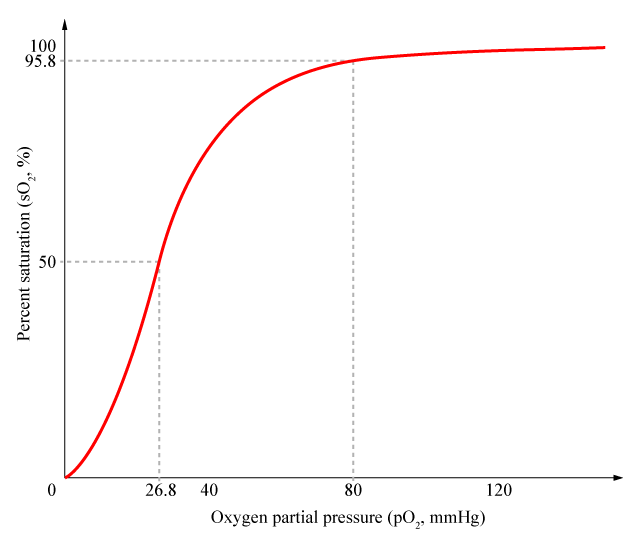 As shown on the diagram above, the percentage of oxygen bound to haemoglobin is related to the partial pressure of oxygen (pO2) at a given site. It explains how when the oxyhaemoglobin reaches a tissue that is using up oxygen (e.g. skeletal muscle), the oxygen will dissociate because of the lower local pO2. This system allows oxygen to be delivered to the areas that need it most. Cooperative binding is beneficial because it works at extremes: when there is low oxygen locally, we don’t want haemoglobin to keep its oxygen tightly bound. Equally, when there is high oxygen (e.g. in the pulmonary circulation), we want haemoglobin to take up as much oxygen as it can. pH – The concentration of hydrogen ions can alter the affinity of haemoglobin to oxygen. This is because haemoglobin in the T-state has a higher affinity for hydrogen ions than it does for oxygen. As pH goes down (so [H+] goes up), Hb enters the T state and its affinity for oxygen goes down. Therefore, more oxygen is needed to achieve maximum percentage saturation. This is known as the Bohr effect. It allows oxygen to dissociate at tissues with a lower pH: a good indicator of rate of cellular respiration. The lower the pH, the more the dissociation curve shifts to right. 2,3-diphosphoglycerate (2,3-DPG) – 2,3-DPG, sometimes referred to as 2,3-BPG, is a chemical found in red blood cells. It is a product from the glucose metabolic pathway. 2,3-DPG decreases the affinity of haemoglobin for oxygen. Levels of 2,3-DPG will increase while at high altitudes to adjust to the relatively low atmospheric oxygen; affinity reduces so more oxygen is released at tissues. The higher the [2,3-DPG], the more the dissociation curve shifts to right. Temperature – Temperature acts on haemoglobin’s affinity for oxygen by affecting the kinetic energy of Hb and oxygen. Higher temperatures mean oxygen has more kinetic energy, making it more likely to dissociate. More oxygen is released from Hb at respiring tissues as they tend to generate more heat. The higher the temperature, the more the dissociation curve shifts to the right. Carbon Monoxide (CO) is a colourless, odourless gas that can be released from faulty boilers or combustion engines. Carbon Monoxide poisoning occurs when CO reacts with haemoglobin at the site of oxygen binding. Haemoglobin has an affinity for CO that is 210x greater than its affinity for oxygen. This means that once carbon monoxide binds to haemoglobin, it is irreversible. Symptoms of CO poisoning are headache, nausea and tiredness but interestingly respiration rate is usually spared as the partial pressure of oxygen dissolved in the blood is maintained at normal levels. Haemoglobin bound with CO has a cherry-red colour and this may be visible in nails beds and mucous membranes of patients with CO poisoning. Treatment is with 100% oxygen and referral for hyperbaric oxygen treatment. CO poisoning is fatal when 70-80% of haemoglobin is bound with carbon monoxide. How many oxygen molecules can each molecule of haemoglobin bind? What percentage of O2 transported in arterial blood is dissolved in the plasma? What is the Bohr effect? What is the mechanism of action in Carbon monoxide poisoning?